Heading to work means leaving your dog on the other side of the closed door, left to its own devices. But exactly what do dogs do all day in a human-less house? It’s the eternal question -- but often, as one pet owner validated, it’s a whole lot of nothing. Several innovators have attempted to solve the problem of a bored, lonely dog by creating interactive pet products. The app-controlled PlayDate smart ball is one such toy. 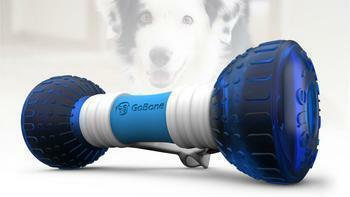 Now, a new boredom-busting pet toy called GoBone is gaining traction on Kickstarter. And home isn’t the only place this toy seeks to be of service. The creators of GoBone hope the treat-stuffed, interactive toy will be used in local animal shelters to provide exercise and mental stimulation to dogs without forever homes. The GoBone is designed to adapt to a dog’s unique physical characteristics, meaning that its play style will adapt to teacup yorkies and Great Danes alike. Santiago Gutierrez, creator of the GoBone, says the games and durability of the toy make it a perfect match for even the most difficult to handle shelter dogs. By providing dogs with physical and mental stimulation, shelter dogs may even become more adoptable. Potential adopters can use the GoBone to interact with a dog, which may help establish a bond and coax out a dog’s true colors. Using a companion app, pet owners and potential adopters can play games with dogs including GoBone fetch (which is similar to Nintendo Wii bowling) and GoBone hide-and-seek. Pet owners can also record and share video of the dog playing, as well as see statistics such as how long a dog played during a given day. GoBone’s crowdfunding effort is roughly halfway to its goal of $60,000, which the team hopes to meet by July 1. For early supporters, the GoBone may be shipped as early as December 2016.